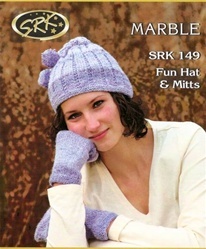 Easy hat with twisted cord & poms made in Marble by Kertzer, and mittens to match! Colors change automatically with this easy to use acrylic yarn. Hat and mitts each take one skein; two for set. Quick and Fun!